Pop quiz: what is an inexpensive, interactive, simple yet savvy way to get lots of prospective parents to connect with your school? They’ve been around for years. They’re a stalwart in the business world, where office dwellers log in to keep up their continuing ed hours or get up to speed on the latest technology. But they’re just as relevant to parents in your area, too. 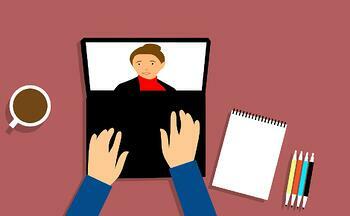 Wondering whether webinars can work for your school? Even if you don’t get the high number of attendees you were anticipating? In our experience with inbound marketing strategy for private schools, the answer is a resounding YES...that is, when the webinar is produced and promoted right. Few content marketing media channels offer the level of interactivity that webinars do. You can present polls throughout your webinar, address audience questions either during, before, or after the event, and respond to chat comments live. Webinars, unlike ebooks or other downloadable premium content, are more like a conversation. This builds trust with the parents you are reaching, which is the ultimate key to a successful school inbound marketing strategy. If you’ve got a hot topic to cover on a webinar - one that addresses a real pain point in your target parent personas - then you’re sure to get plenty of RSVPs. In order to register for a webinar, these parents will need to provide your school with their contact information (phone, email, etc.) as well as any insight into what brought them to your website. Take this opportunity to ask a more personal or prodding question of your registrants to find out what they want to know or what they’re looking for - not necessarily in a school, but even just what their biggest parenting concerns are. It will give you valuable insight into your target audience and how your school can meet their needs. Then, even if some of those RSVPs don’t actually attend your live webinar event, you still have new leads with which to follow up and build relationships! Use webinar CTAs on your blog posts and throughout your website to garner more leads from people who watch the recorded version. Include the recorded webinar in workflows for similar content campaigns that align with the topic. Follow up with non-attendees with a link to the recorded version. Repurpose the webinar content in different ways by turning into a blog series, using screen captures or slides as infographics, creating handouts or downloadable/printable content, and more. 4. Video is the king of content marketing, and webinars are part of that royal family. A webinar is an inexpensive way to get on the video train, using materials that are available to you in-house without the need of fancy production equipment or copious editing. While longer and more in-depth and educational than your typical marketing video, webinars offer many of the same benefits that online video does in terms of credibility and relationship building with parents. 5. Webinars can be effective admissions sales tools. When done right, your webinars can do wonders to help “sell” your school. Sure, you don’t want to create a webinar that’s all salesy and completely focused on your school’s benefits, but that’s not to say that a crafty webinar presenter can’t slip in some compelling arguments for enrolling during the webinar presentation. The nature of a webinar, when managed aptly, opens doors for the speakers to tout how your school specifically can rise to the occasion and meet a parents’ felt need, even if it’s just a well-placed sentence that stirs the viewer’s thoughts and hearts toward your school. Now that we’ve (hopefully) established a solid case for why webinars can work for your private school, let’s get into some practical tips on HOW to make them work. Before you develop your webinar, decide with your team on what you hope this endeavor will achieve. Are you looking for more of a retention tool to delight your current parents, or will it focus on prospective parents? Where in the buyer’s journey are you hoping to meet these people? Are you just going to try to create awareness for your school and establish an initial relationship, or would you like to grab hold of people who are closer to the decision stage? For example, if you’re trying to create awareness about your school, choosing do have a webinar where you talk about all the ways that your school's AP course offerings, dual enrollment opportunities, highly qualified faculty, tutoring program, etc. will not interest the average parent in your community. They aren't ready for all that information yet. Instead, chose a topic like "Helping Your Child Maintain a Healthy Balance with Technology and Life". That's something that just about every parent is interested in. Align your webinar topic with a specific buyer persona (it could touch more than one depending on the topic). Consider these personas and their fears, challenges and frustrations. What are the questions and concerns that you typically hear from them? Choose your topic accordingly to ensure that you’re addressing something that will actually evoke a response, and then use your webinar to answer and bring solutions to those needs you identified. Are they integrated with the CRM you are using? If you are not using a CRM, does it let you capture lead information? Does it have the technology support that provides good moderated screening and text based chat room questions coming in from the audience? It’s best to have more than one speaker participating in a webinar, to keep it more stimulating to your audience. Make sure you identify and recruit speakers who are not only well-versed and knowledgeable about the topic at hand, but who also have a pleasant and engaging tone to their voice. Would you want to have a long phone conversation with this person? Listen to them talk on the radio? Choose your speakers wisely to avoid dry, boring webinars. Many successful webinars employ a moderated panel of sorts, allowing for a conversation with several different “experts” to keep things varied and interesting for the listener. In our experience, we have found that 20-30 minutes is a good time frame for school marketing webinars. Parents are busy and don’t have time for an hour long program (you’ll probably lose their interest well before that time), and less than 20 minutes is likely to decrease the perceived value of the webinar. From start to finish, a good webinar campaign should take about six weeks. This allows adequate time to create the content, procure the speakers, promote the event, iron out any issues, and produce the webinar. Short changing this will also short change your results, likely meaning fewer leads and RSVPs or a poorly executed webinar. Email marketing to your prospective and current parents, with a planned workflow that includes multiple emails and reminders tailored to contact groups according to their engagement. Plan for at least two promo emails at two weeks out and one week out from the event, and consider a day-before reminder as well as a follow-up the day after the webinar to encourage recipients to watch the recording. At least one week before the webinar, have a rehearsal with your speakers, running through the webinar as if it were live. This allows everyone to recognize any potential rough spots and remedy them before the broadcast, as well as get all the participants comfortable with the flow, content, and other factors. Also, on the day of the webinar, ensure that the host and speakers are ready and assembled 20 minutes before the event’s start, to make sure all technology is up and running, no lingering questions or concerns remain, and everyone is set, relaxed, and focused for the presentation. Be sure you have a quiet room to eliminate distracting background noise, and that those nearby know that a live webinar is happening. A slide deck is important when doing a webinar, as it portrays the topic and content that will be discussed. Your slides should be simple and not too wordy. As you think about your targeted personas, you should also consider whether they are a visual or auditory type of audience. Having a video of the host or panelists’ face(s) on the live webinar is optional. If you are new to doing webinars, we generally suggest not to go this direction and just put head shot photos of the host and panelists on the slide deck introduction. Review the speakers’ content to keep things interesting and engaging for the listeners. Stories always tend to go over well and elicit good responses, so encourage each speaker to include a poignant, inspirational, or humorous anecdote in their presentation. Interesting stories can do wonders to illustrate your points and convey your message. And finally, possibly the most important component of any webinar’s success comes after the broadcast turns off: the follow up. Have a plan in place to keep in touch with those who attended, those who RSVPed but did not attend, and all those who didn’t RSVP to keep the momentum going, capitalize on your webinar’s success, and convert your leads into applications and enrolled students!